Yoursay: Bersatu, why infect Sabah with racial politics? YOURSAY | Shafie must stand his ground and not allow promises to be broken. Clever Voter: One says north, the other says south. That sums up a brief description of the Pakatan Harapan coalition. There isn't a day that passes without such inconsistency. Surely their communication machinery can do better. In reality, Warisan doesn't really need to have the company of Bersatu. Indeed, Warisan should insist on having more conditions; after all, it’s Sabah for Sabahans. Anonymous_1536078333: Why infect Sabah with race/religion divisive politics? Not enough damage already in the peninsula? Malaysian-United: Yes, do not let Bersatu into Sabah! I am from the peninsula and racial politics here is very bad. Don't let Malay race-based parties taint Sabah's harmonious plural society. That's not to imply the peninsula is not a plural society; it is, but racist parties like Umno has transformed the peninsula into a Malay-dominated society fuelled by its so-called "ketuanan Melayu" and shallow Islamist ideologies. Now we have a new racist party in the form of Bersatu that is attempting to take up the "Malay agenda" slack left by Umno. Please preserve the lovely multi-cultural, multi-racial and multi-religious society in Sabah by rejecting any of these destructive racist parties. Anonymous 1689721435778173: Usno and Berjaya supported the entry of Umno into Sabah to save themselves from going into oblivion. Now the Sabahans in Umno are trying to get Bersatu into Sabah for their own vested political interests - their political survival is at stake. And Bersatu, of course, is interested for its own selfish reasons. Sabahans, don’t allow Bersatu in. You have seen what Umno did to Sabah. Bersatu will do the same. Spinnot: The Malaysia Agreement 1963 (MA63) was signed between Britain, Malaya, North Borneo (Sabah), Sarawak and Singapore, and registered at the United Nations. What has happened to it now? And you expect Harapan to honour a party-to-party (verbal?) agreement? It’s better that Warisan does not join Harapan. It should remain an associate member. Build close relationships with other Sabah-based and Sarawak-based parties. Unity is strength. Bersatu is putting its "by hook or by crook" theory into practice. Mike: I don't trust this small but big appetite party with so many ministers and deputy ministers. Prudent: "Honour agreement"? What's that? Sabah's politicians are so naive. Anonymous 2251681440225523: Sabah Chief Minister Mohd Shafie Apdal, don't be patient anymore. The racist Bersatu is Umno version 2.0. Theirs is a Malay agenda whereas Malaysia Baru is secondary to them. They want to be relevant to their race and not to Malaysians at large. They are the arrogant troublemakers in Harapan. If the component parties in Harapan do not stop Bersatu chairperson Dr Mahathir Mohamad in his track, they are doomed. Like Umno, Bersatu is a virus which will destabilise Harapan. Malaysian-United: No need to hope, Shafie. Just bar the peninsular parties from entering Sabah. It's the right of every Sabahan to decide the fate of their state. Sabah is good as it is without the racists and religious bigots from Peninsular Malaysia. Kookie: Do you think Bersatu cares about you and Warisan? Your best ally in Sabah is DAP. Even PKR is morally corrupt and with Bersatu; corruption will be endemic once again. Warisan is becoming a "lembab" party. If you don't start leading and developing Sabah, you will be a junior partner when Bersatu establishes itself there. Who will establish Bersatu in Sabah? Ex-Umno members, of course, and there is nothing you can do about it. Anonymous_3f4b: Bersatu secretary-general Marzuki Yahya, answer the damning question whether your academic long-distance degree from the prestigious Cambridge University is a fake or genuine. If in all probability it is a fake, then you have no honour, integrity and principles and must resign immediately. Whether your party Bersatu enters Sabah or not and is in a collision course with Warisan is not your business and not your concern as you are not fit to sit as deputy minister in any event. Ketuanan Melayu: Umno destroyed PBS and Pairin Kitinggan. Bersatu will do the same and will destroy all the Sabah parties. Anonymous_1543386425: I hope Shafie will stand his ground and his assemblypersons would support him. We do not want a repeat of the episode where Kitingan joined Umno in a coalition where the coalition partners take turns to be chief minister, but in the end, an Umno member became the permanent chief minister. 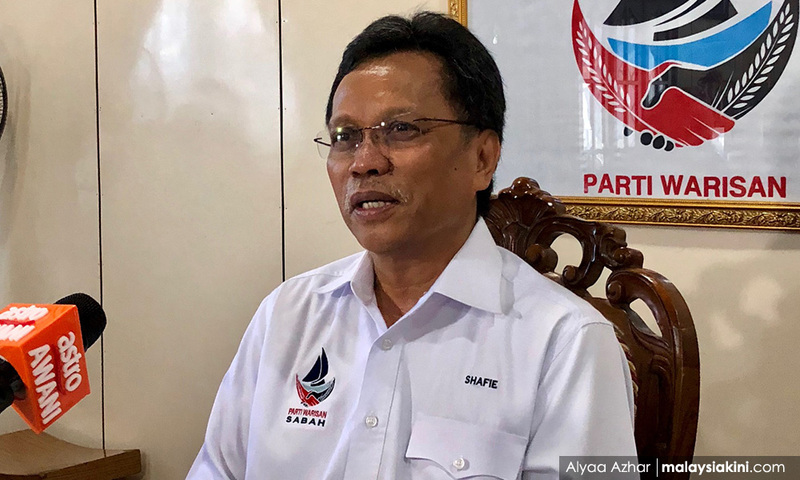 Please, Shafie, do not allow the politics of race to enter Sabah, where Sabahans would likely be divided by race and religion.